You need only to make a few decisions to create a fund supporting the causes dearest to you. Are you targeting a specific charity or a cause? Do you want to participate in granting or delegate the selection of grant recipients to the Community Foundation? Would you like some charitable dollars to flow to named organizations, but enable other dollars to be awarded in a competitive process? A charitable fund agreement may be tailored to the needs, charities, geographic areas or segments of our population that are important to you. We can help you define the purpose of the charitable fund you establish. A charitable fund can be the hub from which all your charitable giving interests are served. You can create a fund now with current gifts or later through your will or other estate planning document. You may give in honor of a milestone, in memory of a special person, or just because you feel the timing is right. 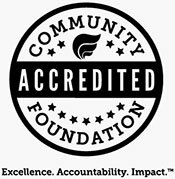 Tax deductions are secured at the time of your gift is received by the Community Foundation. If you are making a deferred gift, please consider notifying us now and becoming a member of our Legacy Society, a listing of named and anonymous individuals who plan to give an estate gift to the Community Foundation. You can establish a charitable fund with many types of assets. A minimum balance of $25,000, which may be accumulated by the fund over a five-year period, is required to maintain most types of funds. Gift Accounts, short-term donor advised funds, do not have a minimum balance. The charitable fund’s balance may need to be larger, depending upon the amount of grants you hope to have disbursed. Smaller gifts may be added to an existing charitable fund that supports a favorite cause or charity. Please consult your tax or legal advisor before making a sizable gift to ensure the contribution is made in a way most advantageous to your situation. A fund may be named for an individual, family or organization, or you may provide a name that will protect anonymity. Every grant from the fund you establish will carry the name of the fund, unless you request otherwise. We work with you to develop a written agreement expressing the purpose of the fund and guiding the way disbursements are to be administered. Standard agreement templates are available and may be customized quickly and easily. Armed with these items, you are ready to establish a charitable fund! Considering your opportunities? Please see our Comparison of Fund Options.